The first event after the summer break was at the Royal Hospital Chelsea to commemorate the actions of the London Divisions during the final one hundred days offensive of the First World War. The hot weather lasted into September, so the open-air service took place under blazing sunshine. It was a splendid event: the Chelsea Pensioners; a military band; pipers; lots of gleaming uniforms; the military wives’ choir; and the preacher was the imposing former Bishop of London, Lord Chartres – in all, enough to make anyone sit up and pay attention. There was a slight hiccup in the military precision when the hardworking subaltern forgot to shoulder arms after the two minutes silence which the band took as the signal to play the National Anthem prematurely. However, Lord Chartres seized control and the service ended perfectly with the salute being taken by the Lord Lieutenant of London, Sir Kenneth Olisa OBE. Afterwards, there was a display at nearby Burton Court of many stands manned by enthusiasts representing the regiments, units and associated cadet associations of the Reserve Army. At the associated reception I was able to catch up with Sir Kenneth and confirm that he will be our guest speaker at the November Freemen’s lunch. The Doggett’s Wager was rowed on Tuesday 4th September as one of the major events of the Totally Thames Festival. For better or worse, there were only two competitors. Admittedly, this meant less of a spectacle at the start but, given that Alfie Anderson and George McCarthy were reasonably well matched, it did mean that the following fleet was able to keep up with the scullers and to watch the race evolve; so often the leader has been a mere speck in the distance! At the start, Alfie established a small, early lead and thereafter was able to dominate the race and counter every move that George made. Susan and I followed on the Zephyr with the Prime Warden of the Fishmongers, last year’s winner Jack Keech and some of the Fishmongers’ sponsors but we were able to disembark at Cadogan Pier and congratulate both very worthy competitors. It’s so tough that there can only be one winner. Susan and I then joined the Watermen’s party on board the Mercia where it was obvious that the party had been running for some time! We were delighted to welcome The Mayor of Windsor & Maidenhead, Craft Owning Freeman Paul Lion and his wife Laura as the principal guests for what was, given the hour, either a late lunch or early supper. Two days later, Court Assistant Richard G Turk and I completed the Masters’ Walk around all forty of the City’s company halls. This was organised by the Environmental Cleaners and started, after a substantial breakfast provided by Cook & Butler, from HQS Wellington. Forty Masters and Court Assistants in their gowns made a colourful display as we paraded through the City. It was another hot day, but I was well-prepared in substantial walking shoes – even if the Master’s gown proved a little heavy after the first few hours. To get around all the halls in the allotted time meant there were few stops and, after a quick photograph in front of each hall, we pressed on to the next. We had mid-morning coffee at the Salters, lunch at the Armourers and we should have had tea at the Furniture Makers – but there had been some confusion with the caterers, so we got a glass of water. We didn’t get to Watermen’s Hall until about 4.30 but Carol and Martin had kindly arranged for the Court Room to be available, so the Masters trooped upstairs to be photographed in front of the fireplace. We finished, tired and hot at Glaziers Hall on the South Bank; my Fitbit told me I had done over 25,000 steps (that’s 21km or 13 miles). 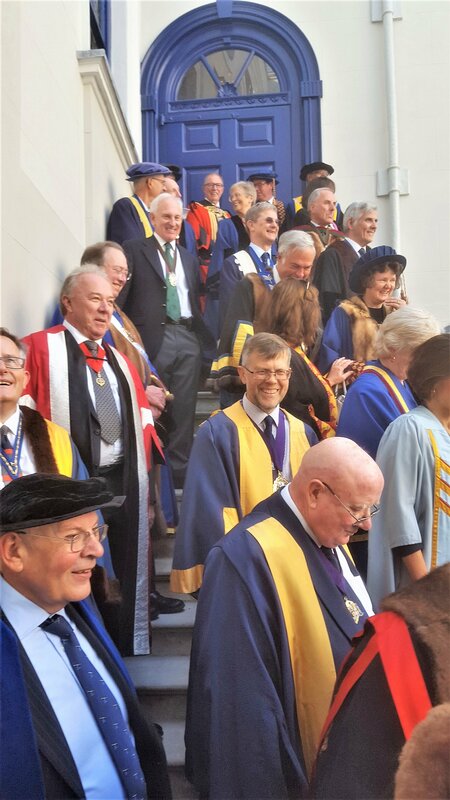 The Master and Court Assistant Richard G Turk taking part in the Masters’ Walk of all the City Livery Halls. 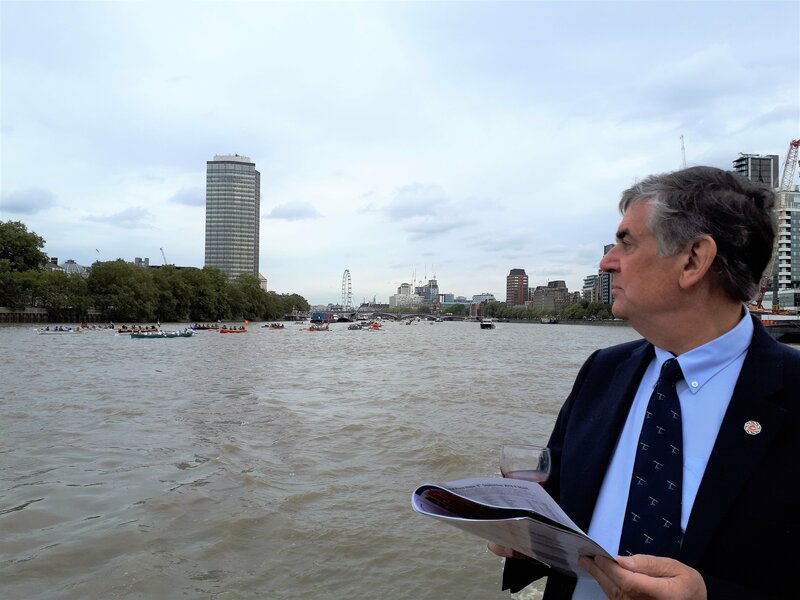 The following Saturday, 4th September, was the Great River Race and Susan and I were invited to join the Chairman of the PLA, Craft Owing Freeman Christopher Rodrigues, on the Interceptor. The race, as always, was a wonderful spectacle and with close attention to the start list we were able to identify most of the competitors including, of course, the Watermen’s cutter, the Jim Holt crewed by the bargemaster, Robert Coleman, with Ben Bartlett, Daniel Bartlett, Daisy Bartlett, Ben Gliniecki, Nathan Evans, JP O’Donnell and Louis Pettipher. They came a very creditable 8th in the appropriately named Thames Watermen Cutter category in which there were over thirty entrants. It was a busy weekend because on Sunday I, as the representative of the Company, was invited to lay a wreath at the Merchant Navy Memorial Service at Trinity Square Gardens. After a welcoming reception in Trinity House, I joined the other representatives of the Merchant Navy, the City, London Boroughs and associated organisations for the parade of Merchant Navy and cadet organisations. We then moved to the area of the Memorial for a short, open-air service followed by the laying of wreaths in memory of those of the Merchant Navy who lost their lives in the First and Second World Wars. There are over 36,000 names recorded on the Memorial, the youngest a cook aged 13, and it was a very moving experience to remember so many lives lost.